The turntable riser is an absolute nessesity for the Rock and Roll Trainer. It is designed to meet the needs of riders who want a level bike when they train. The Riser Ring is adjustable to four heights to simulate flat roads on almost any bike. Sits under front tire for a stable ride, no matter how hard or long the workout, with the addition of a swivel base allowing the front wheel to move freely and help a rider perfect his technique. Your browser isn't supported for displaying eBay items. 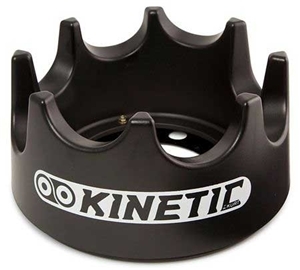 Go to eBay to search for Kinetic Riser Ring Modified for Rock Roll Trainer Kinetic Riser Ring Modified for Rock Roll Trainer.